ISLAM IN INDONESIA - The spread of Islam in Indonesia has played very important role in the change of culture in Indonesia. The history has always been an interesting story to the world. What's on Islam in Indonesia? Here below the story of Islam in Indonesia. In the 1st century to the M-7, an important ports in Sumatra and Java, is often visited by foreign merchants, such as Port Lamuri (Aceh), Barus and Palembang in Sumatra and Sunda Kelapa port in Java and Gresik. 1. Islam teaches tolerance towards fellow human beings, mutual respect and mutual help. 2. Islam teaches that before God, all men are equal degree, except virtue of piety. 3. Islam teaches that Allah is the God Almighty, Merciful and Compassionate, and forbid men dispute, hostile, destructive, and being jealous of one another. 4. Islam teaches that men worship only Allah and not menyekutukannya any time and always do good to our fellow human beings without favoritism. 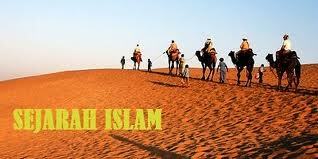 The teaching of Islam is very interesting population of Indonesia. Thus, preaching and Islamic influence spread, both among ordinary people, and the nobility or ruling. The process of Islamization is estimated to have lasted since contiguity occurred. In Aceh, the Islamic empire Pasai Ocean established in mid-13th century AD that the development of the Muslim community in Malacca more rapidly. Ibn Battuta tells the Sultan of the Kingdom of Samudra Pasai, Sultan Al-Malik Az Zahir surrounded by clerics and Islamic preachers. Meanwhile, the spread of Islam in Java has been going on since the 11 th century with the discovery of the tomb of Fatimah bint Maimun in Leran Gresik many H/1082 475 M.
Islamic influence into eastern Indonesia, especially the Moluccas, can not be separated from trade routes that stretched along the center of the international shipping traffic in Malacca, Java, and the Moluccas. According to Tome Pires, people who converted to Islam in Maluku began about AD 1460-1465 AD They came and spread Islam through trade learning, preaching, and marriage. Sulawesi, especially the south, since the 15th century AD has been visited by Muslim traders who probably came from Malacca, Java, and Sumatra. In the 16th century in the area of ​​Goa a famous kingdom in the area there has been a Muslim society. a. Establish a cadre of scholars who will serve as a missionary to areas wider. b. Through his writings and read scattered throughout the archipelago. These works reflect the development of thinking and religious sciences in Indonesia at that time. a. Hamzah Fansuri (Sufi) from North Sumatra. His work, entitled Asrar Al-Arifin fi Bayan ila wa Suluk At Tawheed. b. Shamsuddin Sumatrani As with his work entitled Mir'atul Mu'min (Faithful Mirror). c. Nurrudin Ar Raniri, which originated in India a Quraysh Hadramaut Arab descent. His works include the science of fiqh, hadith, theology, history, and mysticism which include the As Sirat Al Mustaqim (law), Bustan As Salatin (history), and Tibyan fi Ma'rifat Al Adyan (Sufism). d. Abdul Muhyi from Java. His work is a book Kang Pitu Dignity (Dignity of the Seven). g. Shaykh Yusuf Makassar from Sulawesi (1629-1699 AD). His works were not published some 20 pieces that still shape the manuscript. h. Shaykh Muhammad Al Banjari Arsyad (1812 AD) was a scholar who wrote the book sabitul productive Muhtadil (fiqh). Indonesia which consists of thousands of islands have a population which is also composed of various tribes, peoples, customs, habits and culture respectively. Therefore, differences in background, architectural buildings Islam in Indonesia is not the same from one place to another place. Some of the results of structural art in the growth and development of Islam in Indonesia, among others. Ancient mosques in Demak, Clothing Duwur Kasepuhan Court in Cirebon, the Great Mosque and the Mosque of Banten Baiturahman in Aceh. Several mosques still have art still has a building that resembles the art building at the time merupai Hindu. Carving in the pulpit, kalamakara pattern ornate arches, mihrab and form mastaka or memolo showed a close relationship with the Hindu culture, such as Spring Duwur Mosque. Long before the Dutch in Indonesia, most of the archipelago had converted to Islam the teachings of peace, mutual respect, and not to be prejudice against foreigners. Originally a foreign nation such as the Portuguese and Dutch came to Indonesia just to trade, but the subsequent development intentions turned into a desire to make Indonesia as a colony under the power and territory. Portuguese succeeded in expanding its trade area with the master Bandar Malacca in the year 1511 so that eventually they can go to Maluku, Ternate and Tidore. Portuguese is also deadly Indonesian Muslim trading activities in other areas such as Demak. In the year 1527 AD, under the leadership of Demak Fatahillah successfully mastered Banten. Banten and Aceh became a bustling port of Bandar Malacca replace. In the spirit of monotheism and the results obtained from the boarding school education led to the growing cadre of leaders and scholars to the public protector. The nobility and the peoples who originally did not understand the intention of the scholars to defend Indonesia from the clutches of the invaders are slowly come together to defend the archipelago of the Dutch expansion. 1. Tuanku Imam Bonjol through Padri War (1821-1837) in West Sumatra. 2. Prince Diponegoro (1815-1838) through the Java War in Central Java. 3. Aceh War (1873-1904) under the leadership of Commander Pilom, Teuku Cik Ditiro, Uma, and Cut Nyak Din. Trade Syarikat Islam which later became Syarikat Islam established in 1905 headed by H. Samanhudi, A.M. Sangaji, H.O.S. Cokroaminoto and H. Agus Salim. association was established with a view to improving the standard of living of the nation ndonesia, especially in the world of commerce. Standing in 1905 AD in Jakarta is the first movement of Islam in Java. Members mostly offspring (hybrid) Arab. Al Ershad is an Islamic organization that was founded in 1914 AD by Arab traders and scholars, such as Sheikh Ahmad Sorkali. Muhammadiyah Yogyakarta established 18 November 1912 by KH. Ahmad Dahlan coincide on 8 Dhul-Hijjah 1330. Muhammadiyah is not a political party, but the Islamic movement engaged in social and educational. Founded in January 1926 by KH. Hasyim aimed at encouraging the scholars Indonesia by increasing propaganda and education because it was the Dutch banning Muslims established schools like having Islamic boarding school. In their infancy or after gaining independence, Muslims also have a very important role in the promotion of the nation and the state. These roles include through the following. 1) Take care of as well as the demands of religious education in schools and universities guiding religion. 2) Following and notice things concerned with religion and religious. 3) Provide information and religious counseling. One of the oldest forms of Islamic education in Indonesia is a boarding school in the various parts of the region. The institute is headed by a cleric and it's been a lot of schools that appear to be modern. That is, it has a curriculum of Islamic education and education levels-ranging from the basic (primary school), medium (tsanawiyah), and the upper level (aliyah), even up to the college level, such as the Islamic High School (stai) and Institute of Religion Islamic Affairs (IAIN), which has now become the State Islamic University (UIN). 1) Development of mental and religion for the community. 2) Take part in organizing the revolution and construction plans in order universe democracy. 1. Islam preaches peace contains. 2. Propagator of Islam in Indonesia is the person who has the toughness and hardworking. 3. Acculturation occurs between Islam and local culture meskupin Islam still has limitations and should not be explicitly against the basic teachings of Islam. 1. The presence of Muslim traders who have come out and give the teaching of Islam in the archipelago helped give a new feel to the development of an understanding of a belief that already exist in this archipelago. 2. The work of the scholars who form the book to be a valuable source of knowledge. 3. We can emulate the Wali Songo have succeeded in things like the following. a. Making people love to read and study the Quran. 4. Being able to take advantage of the historical heritage, including the heritage sites of the clergy, either in the form of tombs, mosques, and other historical relics. 5. A scholar or scientist demanded by Islam to practice full of exemplary behavior in order to continue to be preserved and used as a model by the next generation. 6. The scholars and unite umara repel invaders with weapons that are not even comparable. 1. Trying to maintain unity and harmony antaraumat religion, mutual respect, and mutual help. 2. Responding to past events with patience and continue to believe that every event must have a silver lining. 3. Source of knowledge in the form of papers from scholars should continue to be extracted or learned and understood meaning.